It was unlikely that this year’s edition of Chelsea-PSG in the Champions league would top last year’s in terms of drama, but it certainly did and was an interesting match tactically too. Mourinho had pretty much a full squad to choose from while Blanc had Moura, Aurier and Cabaye absent through injury. The starting line-ups: Chelsea 4-2-3-1, PSG 4-3-3. This was changed following Ibrahimovic’s sending off in the 31st minute. Chelsea and Mourinho have been a part of some wonderful defensive displays in the Champions League through the years, however last night they were on the wrong end of one. During Chelsea’s early build-up, PSG would adopt a 4-1-4-1 shape. They played in a mid-block and didn’t press aggressively centrally, allowing Matic lots of space but were well organised in blocking passing lanes. Cavani played slightly higher on the left hand side, making an asymmetrical 4-4-2 at times. As Chelsea attempted to move the ball further into the middle third, over the halfway line, one of PSG’s midfield three would close them down, with the other two covering behind. PSG’s midfield three were very fluid in both defence and attack, covering large areas of the midfield. PSG’s back four were immense. They played well both organisationally and individually (yes, that does include Luiz). They played in a mostly position-oriented zonal system, with the full-backs only marking men in wide positions if they had the ball. The back four astonishingly had a 100% tackle success rate (14/14), most notably Marquinhos and Silva with 6/6 and 5/5. Marquinhos also completed 5 interceptions while Silva completed 4, which meant they were 1st and 2nd in the match for tackle success % and interceptions. Between them, they almost completely neutralised the threat of Hazard and Costa, who both positioned themselves down Chelsea’s left-hand side. PSG only allowed Chelsea one shot in the first 31 minutes before Ibrahimovic was sent off. They changed to a 4-4-1 shape after the sending off as shown below. The first sign of how the sending off would change the match came just a few minutes after Ibrahimovic’s red. Costa dribbled the ball into the penalty area in a central area, an area which Motta would have been marking if playing in PSG’s previous 4-1-4-1 shape. Costa was tripped and should have been awarded a penalty. 2nd half lineups after Ibra was sent off and Willian was brought on for Oscar. PSG defended resolutely after the sending off. 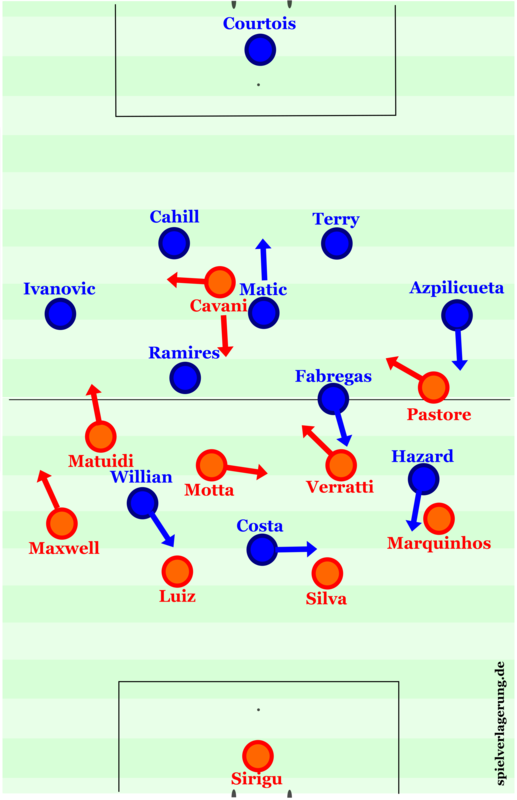 They sat back in a deep and narrow 4-4-1 while Cavani stood on the left-hand side in the area Ivanovic had vacated waiting for long balls forward in attacking transitions. When they needed a goal towards the end of both normal and extra-time, PSG pressed in a 4-2-3 shape. PSG allowed Chelsea to have 271 final third passes, 120 more than the Parisians had. Despite this, Chelsea struggled to convert this into clear goalscoring opportunities. Chelsea started the match with a typical Mourinho defensive selection of Ramires at RW. Ramires would track Matuidi’s runs (who played almost as a left-winger for lots of the first half, especially due to Cavani’s advanced position) as well as track Maxwell’s bursts forward. He was moved to centre-midfield in more of a 4-1-4-1 shape after half time and Willian replaced Oscar who was very poor first half. This change was due to Chelsea no longer needing two pivots to protect the defence and designed to give Chelsea a wider, more penetrative option versus what Mourinho knew was going to be a more defensive PSG side after the sending off. 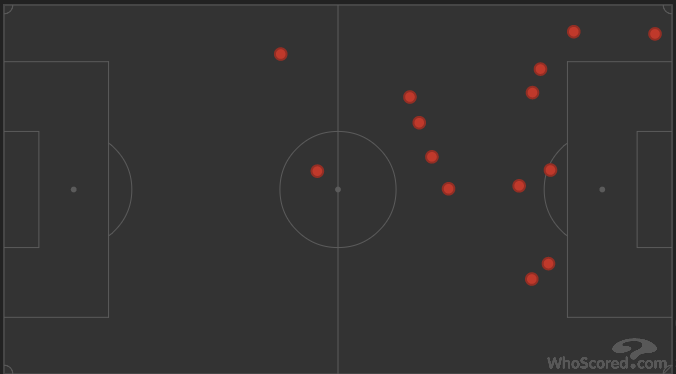 Willian made 5 crosses in the match compared to Ramires’ 1. As I have briefly mentioned, Costa was more oriented around Chelsea’s left-hand side, often standing on the left touchline when Chelsea had the ball in their middle third. This was so he could receive the ball facing the goal, with space to run into, while also acting as a wide target man if Chelsea were to play a high diagonal ball. When he was in this position, Hazard would be central, acting as a false 9. He would drop and look to turn to run at Luiz and Silva or would make diagonal runs to combine with Costa. This choice of positioning was strange as Marquinhos and Silva are clearly a more solid defensive pair than Luiz and Maxwell on the other side. They probably should have placed this sort of emphasis on their right side of attack instead of their left. Drogba came on at the start of extra-time and was used not only as a long ball option but also to allow him or Costa to drift wide, creating an overload while there was a striker in the middle to aim a cross at. British pundits going crazy at the modern game. A social media uproar. The debate over man-to-man versus zonal fixed on our TVs for the next month. These are all things that would have happened if both of the goals Chelsea conceded were a direct result of zonal marking. They weren’t,however, as it was man-marking that allowed both of PSG’s Brazilian centre-backs to head their side into the quarter-finals. For the first PSG goal, the PSG players clustered together, meaning Ivanovic was blocked off when trying to track Luiz as the former Chelsea defender made a near-post run. Ivanovic couldn’t recover and Luiz had a free header to put PSG level in regulation time. For the second goal, Terry marked Silva while Cahill marked Luiz. Luiz pulled towards the back post as Motta aimed his corner at Silva. This movement caused Cahill to come in between Terry and Silva, holding hands with his centre-back partner. As heart-warming as this was, it wasn’t effective defending and left Silva completely open to float a beautiful header over a poorly-positioned Courtois. In your face traditionalists. Chelsea showed that they are simply not as creative and dangerous against a properly organised defence, which is hard to come by in the Premier League these days. They looked like a team that lacked a bit of experience in attack, a team with no real direction. Mourinho conceded that his team were slightly overawed by the occasion and that is something I would agree with. PSG go marching on and are real contenders in my opinion. This competition has proved in the past that it favours strong defences, and that’s certainly something Laurent Blanc’s team has. We saw the brilliance of the best defender of this era, and witnessed the coming of age of who I think will be the best defender of the next. I really thought Costa allowed himself to fall when he saw a defender cutting off his fonal turn towards the goal. Yeah Cavani’s leg impeded, but Costa willfully lost balance when he saw there was nothing left to salvage the scoring opportunity. It would be nice to see the modern game without the players receiving their stage cues from the contact. Thanks for the article. As a newer football watcher, these diagrams and explanations are so helpful. Hello TT. Thanks for taking the time to look into this match. As Chelsea fan I could not believe what I was watching, I consider this to be the worst Chelsea have played this season (including Newcastle and Tottenham). I noticed your article doesn’t mention something that bothered me immensely, which is Chelsea’s (lack of) pressing. 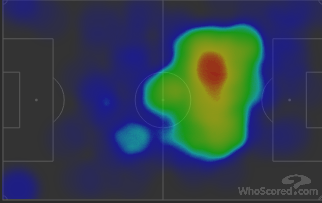 They spent most of the second half and extra-time walking around the pitch, not putting the slightest pressure on PSG’s midfield 3, let alone their defensive line. I mean, the French side finished the match with 50% ball possession and 84% passing accuracy whilst playing with 10 men. Sadly, their attitude when on the ball wasn’t any different, the lack of movement was glaring and forced way too many backpasses (Matic and Ramires were specially guilty of this). 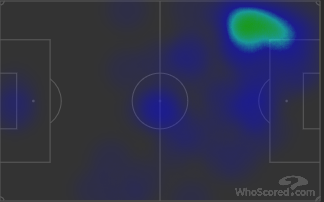 Hazard had 7 dribbles by the end but I still feel he was holding back after Chelsea’s first goal, avoiding taking defenders on when there was space to do so. Another obvious issue was that Chelsea’s fullbacks, as good as they are (which is undeniable), offer very little going forward and often fail to stretch the opposition’s defence. Most of those problems have been recurring since January specially against teams who defend well. So I don’t buy the “the players couldn’t handle the pressure of the moment” rubbish, they looked absolutely clueless the minute Ibra was sent off. I was wondering if that’s to do with Mourinho’s match preparation (too focused on defensive organization whilst ignoring pressing and offensive organization).